To escape the Texas heat, my wife and I headed out to the Sedona/Flagstaff area a couple weeks ago. We decided to drive across the panoramic Southwest not having explored that part of the US before. It was wonderful drive and now that cars are air-conditioned and you do not need to sling a bag of water over your radiator before crossing the deserts, very comfortable. We came back on I-40, which was the historic Route 66. About 40 miles east of Sedona, we saw signs to view this meteor crater. I am kind of an astronomy buff, so we made the turn and headed down the seven mile road to the crater. The site is on private land, not in the Federal park system. When I saw the big building and large parking lot full of cars, I thought it was going to be a “rip-off.” We bought our tickets and climbed the steps up up up into the restaurant/museum/gift shop. My “spidey” sense was tingling and telling me to run while I had the shirt on my back. But the museum was well done and they had a great movie. About this time we found our way to the glass doors out to the catwalks that rimmed the crater. Holy Moly! What a spectacular site. 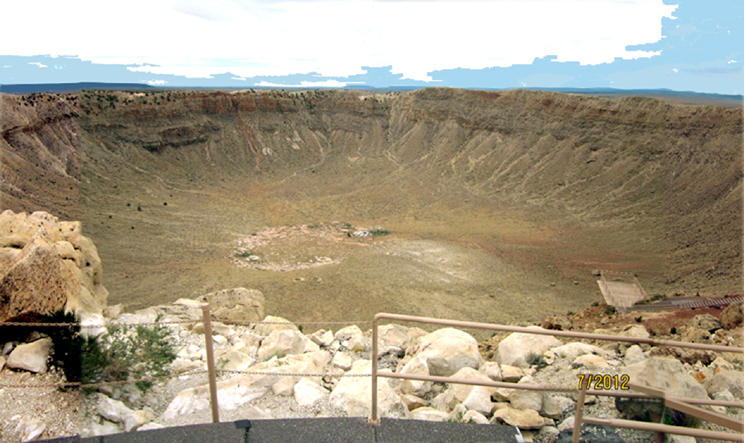 A jaw dropping crater, a mile wide and over seven-hundred feet deep, extended before us. It looked just like the ones on the moon seen with a small telescope. Suddenly I remembered that I had seen photos of this one in astronomy books over the years. 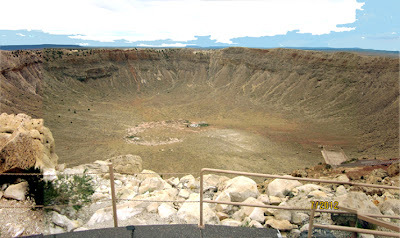 The amazing thing was it was the result of a very small meteorite, estimated to be only 150 ft in diameter. Not only that, but they estimated that its shock wave flattened everything in seven-mile radius. This little greeting from outer space was very recent in geologic time, about 50,000 years ago. About the time Cro-Magnon Man, the first truly human species, was knapping flint points and wrestling saber-toothed tigers. In the scope of the universe, the meteorite was sub-microscopic. It made think about the possibilty of one significant size, say a couple miles across striking the earth. I am pretty sure life would end as we know it. For example, assuming that size and damage was proportional, a meteor a mile across, 35 times bigger than this one, would create an impact crater be 35 miles across and flatten everything in a two-fifty mile radius. A meteor one-mile across would still be a sub-microscopic body in the universe. This is not a novel idea, and has been discussed at length on science channels and umpteen movies disaster movies have been releassed about it. Yet, after you see this crater, the plausibility of such a disaster will haunt you. 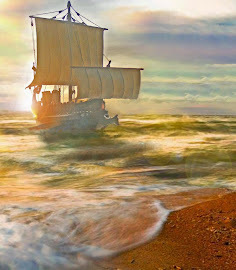 One note: my novels are centered around a great sword, Clach na Adhar,(which means Stone of Heaven in Scottish Gaelic). In the stories a small meteorite fell to earth and was forged into a sword. I was curious about the composition of this meteor and bought a small fragment in the gift shop. (They love me at museum gift shops) The small lump was 92% iron, 7% nickel and 1% other stuff. I’d say it was ready to heat up and pound into a wondrous blade.